This week marks National Crime Victims Week and the Erie County District Attorney is marking the occasion to spotlight the assistance available to crime victims through his office's Victim/Witness Bureau. 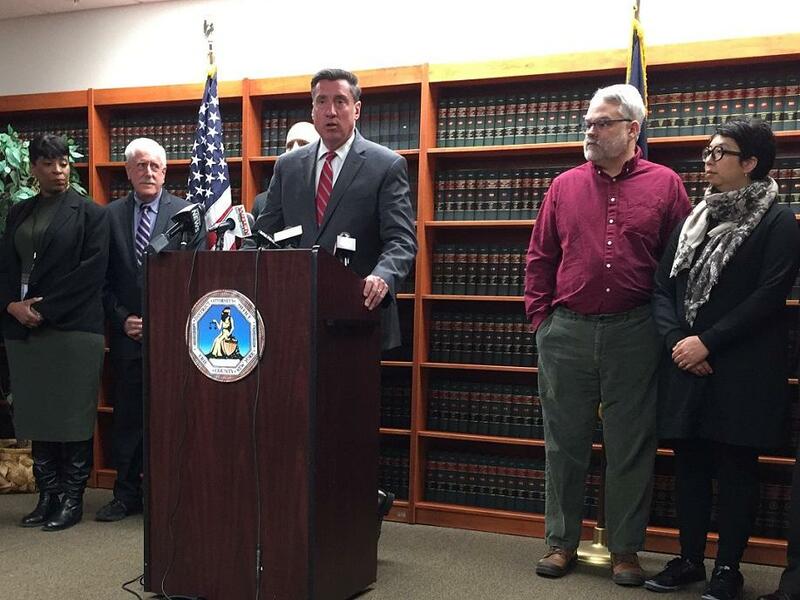 District Attorney John Flynn was joined by three crime victims. Roberta and David Anderson were struck and injured by a drunk driver while they rode their bicycles on Elmwood Avenue while Dr. Roy DeFrancis was the victim of a larceny theft. As they shared their stories, Flynn pointed out at the Victim/Witness Bureau provides direct assistance and services to victims of various crimes, violent or not. Erie County District Attorney John Flynn hosts a news conference in his offices Tuesday, marking National Crime Victims' Right Week. He was joined by members of his Victim/Witness Bureau as well as past crime victims who shared their stories, including the support provided to them by the bureau. "Whether it's a physical violation or an economic violation or a mental violation, there has been some sort of violation. We as prosecutors and members of my staff recognize that violation," Flynn said. "We need to ensure that the victims are represented, the victims are heard and that their wishes, to a certain extent, are adhered to." He also discussed his office's response to violent crimes, explaining that in the case of a shooting, a member of his staff is ready to respond at any time around the clock. "We have one of our advocates go to ECMC to meet with the victim and their family. That makes us unique in New York State," he said. "In addition to that, we service these victims, whether or not an arrest has been made." Flynn, who was also joined by State Senator Tim Kennedy, took the opportunity to push for New York State's passage of the Child Victim Act, which would make it easier for many victims of childhood abuse to pursue criminal or civil action as adults. The bill has stalled in the Senate for more than a decade. The number for the Erie County District Attorney Victim'Witness Bureau is 858-4640.